The Best Books For Kids Age 9-14? You Tell Us This summer, with your help, we're assembling the Ultimate Kids' Bookshelf — a collection of 100 titles every 9- to 14-year-old should read. What was your favorite book when you were that age? Weigh in with your nominations. Nominations are now closed, but check back in a few weeks to see the titles that made it onto NPR's Ultimate Kids' Bookself. 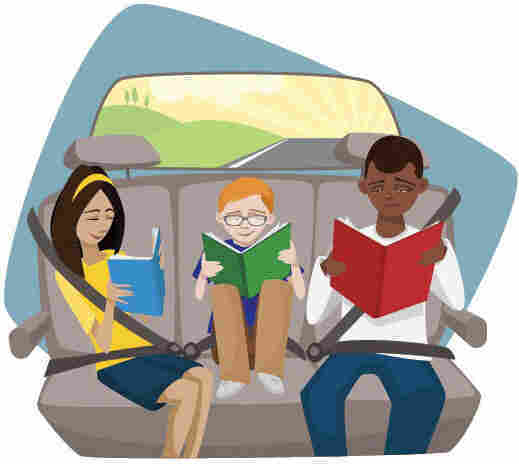 Ever since we launched NPR's Backseat Book Club in 2011, our young listeners have been busy reading — classics like The Wizard of Oz, Black Beauty and The Phantom Tollbooth, and newer tales, like The Graveyard Book, The Mysterious Benedict Society and the Lunch Lady graphic novels. (Here's a list of all the books we've read so far.) This summer, with your help, NPR Books will assemble the Ultimate Kids' Bookshelf — a collection of 100 books that every 9- to 14-year-old should read. 1. Limit yourself to five titles per post. Don't hesitate to nominate a book that someone else has already listed. We'll tally your nominations and take note of the most popular titles. 3. Feel free to nominate a series. The Diary of a Wimpy Kid series or the Harry Potter series, for example, will be considered as single, collective works — so don't bother listing the separate titles in the series. To qualify as a collective work, the books in a series must be written by the same originating author or authors, and must tell a more or less continuous story — usually about a consistent group of characters. If it's a very large series — such as Goosebumps or the Nancy Drew books — feel free to nominate your favorite title as an individual work. Which books did you love when you were this age? Which books do your kids love today? We'll publish our 100-title bookshelf later this summer. For now, send us your lists!